Regardless, this past weekend I made it a point to continue the multi-week tradition of hiking a state park with my dog. It is one of the last holdouts of snow, as the area is not plowed and the lake keeps temperatures a bit cooler than surrounding communities. Even now, it is primarily a slush-filled hike, but I enjoy the effort for some uncommon reasons. #1 – There are not many people at the state park during the colder months, especially when you are looking at multiple feet of snow on a hiking path. The less number of people the more desolate, but also the riper for exploring off trail and allowing my dog to roam without a leash. That last part is easily the most enticing for the both of us. I tend to walk at a steady pace, whereas my dog loves to start and stop, run ahead and lag behind, in a zig-zaggy fashion that is much more fun to observe than to battle against. 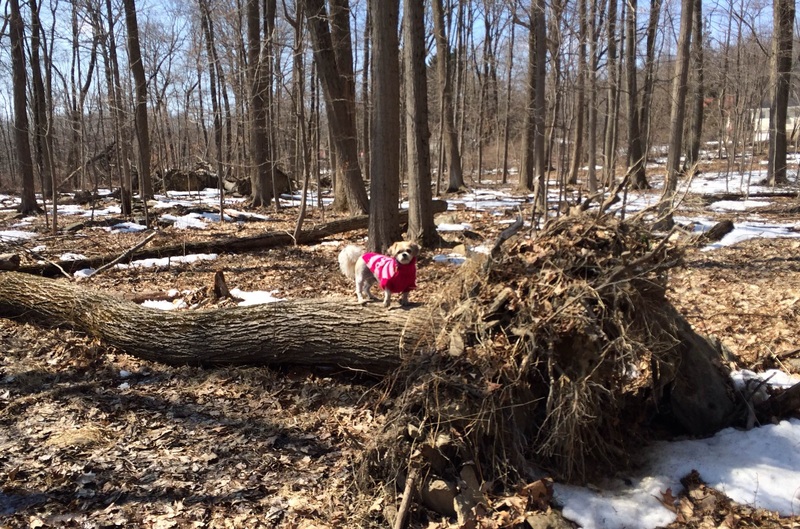 #2 – The packed snow makes for quite a hike for myself and a breeze for my dog. She is light enough to tread comfortably over the snow without much issue (aka falling through the snow), while I am going to take extra effort in planting each step through the powder. It also keeps the scenery from feeling recycled, in that we have done this hike more than ten times this winter, and each time it feels a bit mysterious given the conditions. #3 – The cold air keeps the hike from feeling exhausting. I notice my dog does not want to drink that much water on such hikes, as her body temperature never really goes too high. In general, it keeps the activity from feeling difficult, even if the end result is a great workout. #4 – More snow means less defined paths. The fact is each part of the park is carefully curated in the spring, summer, and fall seasons. During the winter, it feels a bit more like a wilderness. Animals are out, the trees are bare, and in general things are much more serene. Soon, these same hikes will become leisurely walks, which while fun, are not nearly adventurous (but ten times more populated). #5 – We always want to look ahead. If it is the winter, we look towards spring. If it is spring, we are excited for the summer. Come late August, everyone starts thinking football season, then Halloween and finally the holidays. Sometimes it is worth it just to live life as it is and take in where you are and what you are doing as is. #6 – Winter is underrated in the early months of a new year and overrated in December. It is romanticized for Christmas, but rarely delivers for the holiday itself. Then, like a flip of a switch, everyone hates the snow and the cold during the months it is most potent. January, February, and March are marked by people taking shelter and staying inside for most of the day. The fact is, these months can be more than just an early sunset if you find something constructive to do. Besides most people do not go to bed any earlier and instead just watch television later into the night. #7 – The days are getting longer. Ever since the end of December, the days are getting longer, sunlight last a bit more, and yet we act pretty much through the start of March like the days are still ending by 4:30 PM. The reality is that the past two months the sun has been staying out longer even without the help of Daylight Savings. More to the point, by the end of June, the days begin to incrementally get shorter. Now for the above seven reasons why I do not necessarily mind the weather now, I have to admit it is much easier to rattle off hundreds of reasons at the forefront of my brain as to why I am sick of snow and will be happy to wish it farewell for several months. Anyway, I figure I can at least tell myself those above reasons have kept me sane over the past few months of what has easily been one of the harshest winters I can remember.